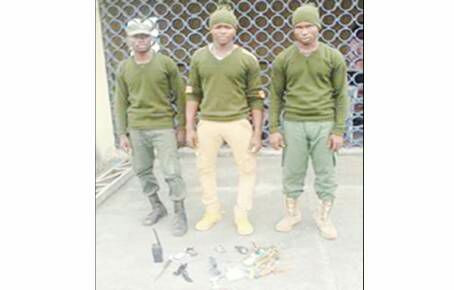 Imo police arrest three suspected kidnappers in military uniforms with charms - BlogIT with OLIVIA!!! Three suspected kidnappers operating in military uniform at Nwaorieubi in Mbaitoli Local Government Area of Imo State were on Monday arrested by the state police command. The state Commissioner of Police, CP, Mr. Taiwo Lakanuwas paraded the suspects: Odinakachi Uzowuru, 23 from Isiala Mbano Local Government Area, Moses Ezekiel, 27 from Arondizuogu, Ideato North Local Government Area of the state and Uchenna Joseph, 27 from Ikwo in Ebonyi State yesterday before newsmen at the state police headquarters. Lakanuwas said the trio was arrested following a tip-off by good-spirited individuals, adding that exhibits recovered from the suspects included two Jack knives, one walkie-talkie and three rings which the suspects claimed were charms.The CP recalled that hoodlums dressed in military uniform have, in recent times, been terrorising the state.He however, said that an extensive investigationwas being carried out to round off all criminals connected to the kidnap gang.Lakanuwas urged residents to be eagle-eyed and report crime-related incidents or persons tothe nearest police station.